In an extension of the living area lies the dining area, highlighted in a harmony of pristine whites. “The elegant white dining set was used to give the space a contemporary look, and the white-and-cream overhead pendant lights added to the effect,” says Nair.The ivory-toned dining table is juxtaposed with an oak-panelled bar. 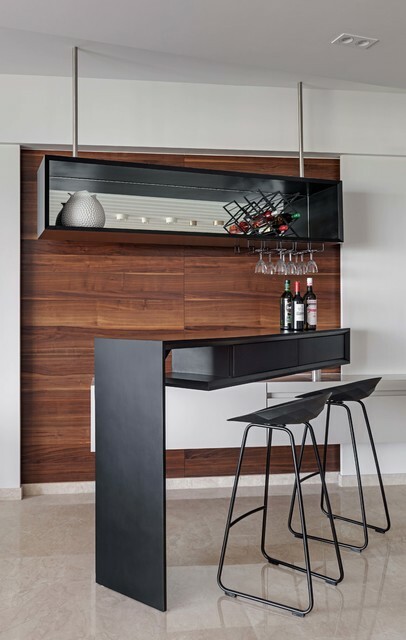 Paired with a convenient swivel counter and a matching ceiling-hung storage cabinet, the rich brown of the bar enriches the plain vanilla wall.